An emotive, contemporary duet that charmed with a universal parable. A chamber work replete with neoclassical speed and musicality. A fun-filled, energetic ensemble dance to welcome the coming holiday season. 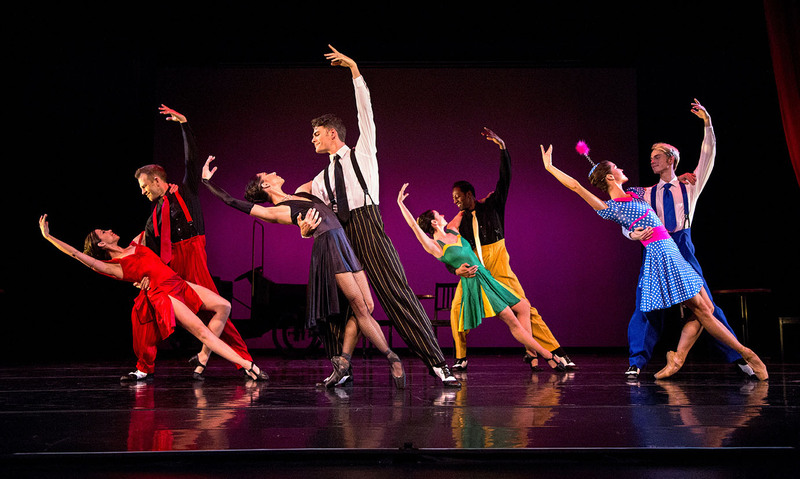 What a well-crafted program to kick off Diablo Ballet’s twenty-fourth year! This was a special evening from many perspectives – the audience was brimming with excitement to see what the long-running East Bay company had in store; artistic excellence was coupled with pure joy; and there was a striking display of choreographic breadth. The evening opened with No One Does it Like You (2010) by Diablo Ballet’s Resident Choreographer Robert Dekkers, set to music by Department of Eagles. The lights warmed to reveal Jackie McConnell on a stepladder stage right and Michael Wells seated stage left, a painting tarp arranged behind him. Both had paint splatters on their clothes and faces, indicating that we were joining a painting project that was just starting, in process or perhaps, just completed. McConnell began slowly and deliberately climbing up and down the ladder, legs and feet articulating with utmost precision. Wells rose and all of a sudden, the pair took over the space with extreme physicality full of level changes and sweeping lifts. As No One Does it Like You continued, all parts of a relationship were mined through Dekkers’ incomparable choreography: playful, flirtatious sections, passionate embraces, even moments of tentative frustration. The unison phrase material signaled a long-term connection, the kind that is deep, enduring, and exists in another realm entirely. But the most striking aspect of the duet (in addition to McConnell and Wells’ impeccable performance) centered on the simultaneous exploration of the literal and metaphorical. Most major painting projects need a ladder, in order to reach every surface, and most major painting projects benefit from teamwork. And we saw that literalism in this pas de deux. But there was more. As McConnell and Wells traversed up and down the ladder, it felt like we were watching their relationship take steps forward and backward, and seeing the pair experience these ups and downs as a team. After a brief pause, Diablo Ballet went back in time as Christian Squires, Amanda Farris, Rosselyn Ramirez and Larissa Kogut took the stage in Valse Fantaisie, choreographed in 1953 by George Balanchine. This quartet is neo-classical ballet in its truest form – a combination of high velocity, precision and forward motion. Staged for Diablo by Marina Eglevsky, Valse Fantaisie eats up space with both intricate footwork and large steps alike: balloné, jeté entrelacé and fouetté. In addition, the ballet’s exquisite detail and attention to the score (by Mikhail Glinka) can be found in subtlety: the tilt of the head or the arms pulsing to the music. Particularly noteworthy was Squires’ pas de poisson phrase and Kogut’s series of relevés. After intermission, it was time for a hearty dose of holiday merriment with Sean Kelly’s A Swingin’ Holiday, originally created for Diablo back in 2012. The clever beginning finds three cast members (Jordan Tilton, Squires and Alexander McCleery at this performance) dancing the first selection down the aisles and right in front of the stage. It’s genius. Not only is the audience hearing a familiar holiday tune, they are also amidst the action, immersed in the scene with the ensemble – which also included Farris, McConnell, Ramirez, Felipe Leon and Raymond Tilton. And with Kelly’s choreography, Cynthia Sarmiento’s costumes, Jack Carpenter’s lighting and the Diablo Ballet Swing Orchestra under the direction of Greg Sudmeier, that scene feels like being transported to the ‘Hot Box Club’ from Guys and Dolls. Throughout the suite of dances, Kelly’s movement runs the gamut from jazz drags to parallel passé jumps to barrel rolls to Fosse-inspired hat choreography. 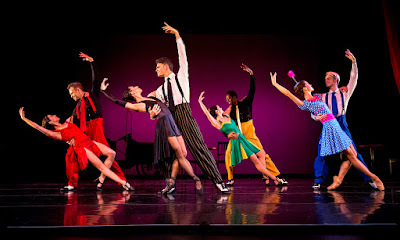 Ramirez’ lightning fast petit allegro shone in her Let it Snow solo, filled with quick pas de chats and glissés en cloche, while McConnell and Squires wowed with their acrobatic jive and swing duets. The Nutcracker March (which I believe was newly constructed by Kelly for 2017’s edition of A Swingin’ Holiday) delighted with seamless phrases of classical ballet and jazz, all perfectly marked with a bit of humor, and the March’s balleté sequence, led by Farris, absolutely sparkled.